As I mentioned in an earlier post, I was spending Saturday cropping with the lovely ScrapMuch?! ladies. I took that opportunity to tackle some UFOs (Un – Finished Objects). Admit it, I know you have some UFOs too!!! I actually have a bin, with projects likely dating back to 2008, just waiting for the “perfect” pictures to complete them. I also admit that I have gone back to the bin, thought “what in the heck was I thinking with this one”, and pitched it outright. Some UFOs are best to stay UFOs. Since I made tremendous progress with them, I opted to do a layout for the colour challenge. And here is my take using the colours in the challenge. 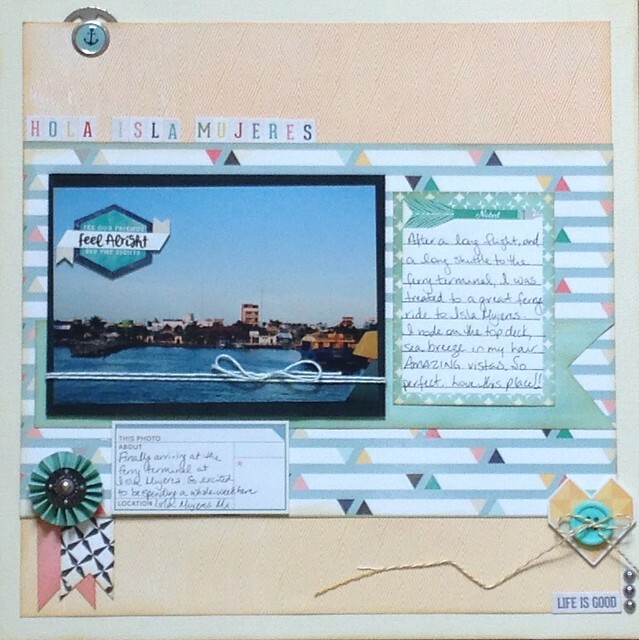 I’m slowly working my way through the Carta Bella Hello Again collection kit. It’s a pack I’ve very much loved and been tempted to hoard, but I’m finally in a space of wanting to use paper while I still love it before it grows old and stale on my shelf. Thankfully, the papers pretty much had everything from the challenge so it was easy to use them and then add embellishments to go along. To play along, all you have to do is create a new paper crafted project, of any type, that uses the colours from the challenge and post it on your blog or any other online forum (ie. your Flickr Account) that you can link us up to, by our deadline. Then link it using the Inlinkz tool in our sidebar. One lucky participant will be winning a prize, drawn randomly!! It doesn’t get much better than that! Everyone is welcome to play, though there may be some shipping charges to our international winners. The deadline for linking to this challenge is June 29th, 2014 at midnight. So make sure you share your creation to the InLinkz tool on the ScrapMuch?! site! 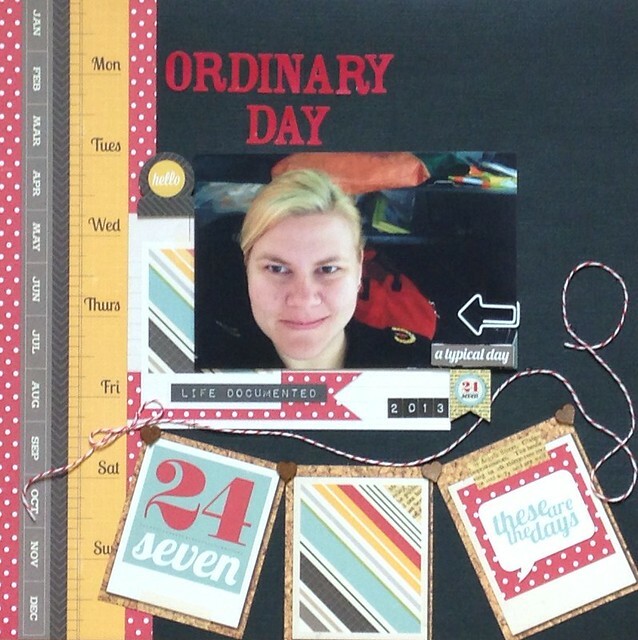 It can even be a card, or a home decor item if you aren’t feeling up to making a layout! I’m looking forward to seeing what you create! 13 years ago today I was sitting in my first day of orientation. It was the best job prospect I had since graduating 3 years prior when there were minimal jobs in my field. I had been working in a “volunteer” position but it was terminated 9 months after I started due to a restructure. And then this opportunity came along. It was part time to start, but they made it sound like full time was a very real possibility very soon. As it turns out, full time started about a month later. I was feeling a mix of excitement, nerves, uncertainty and relief. I was beginning to think I was going to have to go back to school and seek out a new career. I was done with working food/retail. I didn’t love my brief foray into admin and software programming. Like any job, it’s had it’s ups and downs. Thankfully the rewards still outweigh the tough times. Our former director suggested the average lifespan in this career is 5-8 years. I feel like the first 13 have been such a blur. Some amazing moments are permanently etched to memory. Some horrendous moments I’d rather forget are also permanently etched to memory. This career has changed me, changed my outlook on life, forced me to re-evaluate what is important in life. I won’t lie, I do still have moments of “if I knew then…”, and I probably always will – especially as it pertains to things like health risks of shift work, PTSD (thought I might have dodged that bullet, alas, no), and even things like what it’s truly like to be an outside worker (Hello bitter cold, driving rains, sweltering heat, impromptu hikes deep in the rough, etc.). I’ve also been so lucky to have met and worked with some of the best people you’d ever want to meet. I don’t overly want to dwell on my memoirs. It’s still far too early in my career for that, and OMERS tells me I still have ~19 years to go. That being said, I do have a work related layout I thought today would be a perfect day to share. It was a selfie I happened to snap last year when I was having a good hair day! 😉 I wanted to use some of Simple Stories 24/7 line for the layout because the job is 24/7/265. A rare layout, just for me. No challenges. No sketch inspiration. Just a selfie and a collection pack. Supplies used: Cardstock-Bazzill; Patterned paper-My Mind’s Eye; Embroidery floss-Close To My Heart; Photo corners-Scrapbook Adhesives; Pearls-Melissa Frances; Title stickers-Crate Paper; Paint-Making Memories; Mist-Tattered Angels Glimmer Mist; Die cut-Silhouette; polka dot washi-stash; TIM HOLTZ STUFF-metal flowers, safety pin, grungeboard t and flourish, washi tape, distress ink, token, journaling tag! 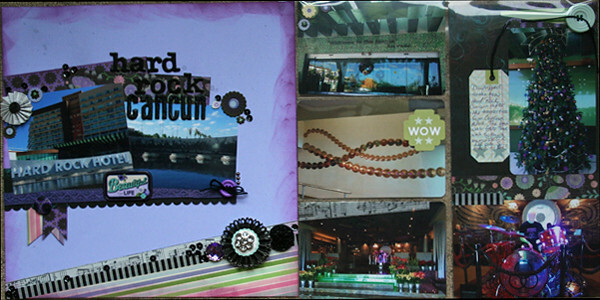 I have been very very lucky to take a few workshops with Tim Holtz over the years. He is truly amazing. 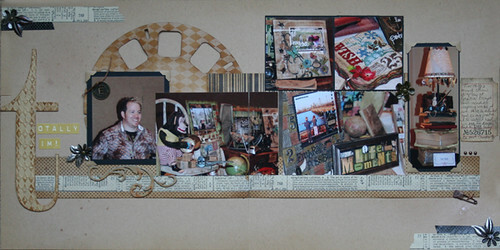 The pictures in this layout are from Heidi Swapp’s Creative Escape 2009 where he taught, and the day before Creative Escape officially started all teachers had a meet and greet and trunk show to display their personal works. His table was incredible! So many amazing items of interest, vintage finds, beautiful creations, etc. That was also the year of the lamps where Creative Escape teachers and alumni were invited to style the same lamp and then they’d be raffled and auctioned off for charity (the Leukemia and Lymphoma Society). Tim’s lamp sold for an amazing $29,000.00 for charity. Tim gave an amazing write up of the event on his blog. There’s also a YouTube of the auction for charity. Note to my fellow CE alumni this will make you miss CE (and if you’re lucky enough to be attending Inspiration Unlimited create MORE excitement for Heidi!!!!). I took a little bit of license with the sketch adding an extra photo and a journaling block, as well as the washi on opposite corners. I really wanted to capture the grungy, vintagey feel of Tim’s work. I also wanted to make sure I did journal about the event, about Tim’s trinkets and treasures, and of course, about the $29,000.00 lamp! I have *so* many photos from the Creative Escapes over the years and I’m still scrapbooking them some 5 years later. I refuse to believe I’m “behind”. Make sure you pop on over to the ScrapMuch? blog and see what the rest of the team is up to! Then get inspired, play along and link up by the end of the month for your chance to win an awesome prize! Have a fabulous weekend! I’m not sure what happened in the last few weeks since my last reveal, except that I’ve been working a bunch, and sadly not creating a heck of a lot. I admit I’ve been taking a bunch of overtime shifts to add to the coffers for my Inspiration Unlimited trip in September. Vegas isn’t exactly an inexpensive city, and I’m a girl with expensive tastes too! I’m also spending a few days at Aria, which is connected to Crystals shopping center (HELLOOOOOO LOUIS AND TIFFANY!!! COME TO MAMA!! )… You get the idea..
Today I’m sharing 2 projects I whipped off my Silhouette for Mother’s Day (that was about a month ago wasn’t it?). 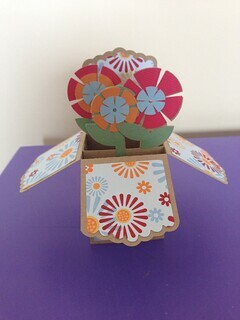 I made 2 of the pop up cards (with slightly different patterned paper); one for the mom, the other for the mother in law. 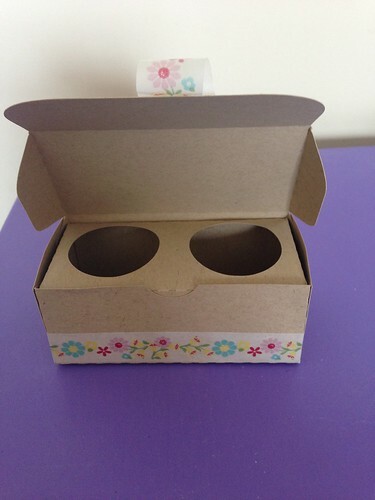 I also made a little K-cup gift box for Steve’s mom because she wanted an ECS giftcard, and of course that had to come with a K-cup or two! 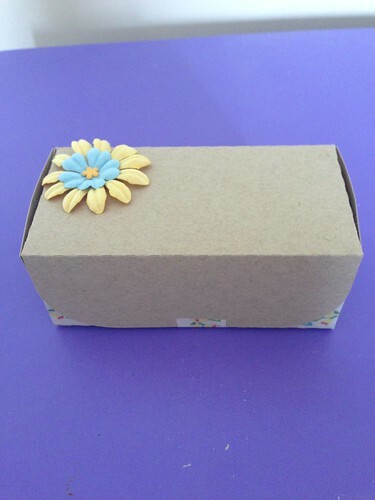 Here is the box (Design ID #51960); cut out of my signature kraft cardstock, and with some Prima flowers and washi tape. 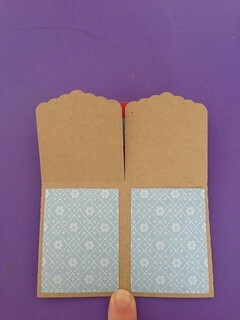 The washi adds both decoration and stability. Have a fantastic day. 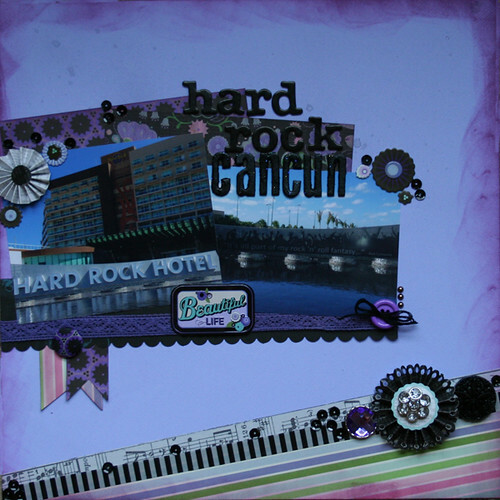 Stay tuned for tomorrow’s ScrapMuch?! reveal day! It’s a 2 pager because it’s the start of the month!